A traditional, convenient and multi-purpose folder from Buck Knives. Slightly smaller than the Stockman the Buck Cadet also has the same three convenient blades: Clip, Sheepsfoot and Spey. A traditional, convenient and multi-purpose folder from Buck Knives . 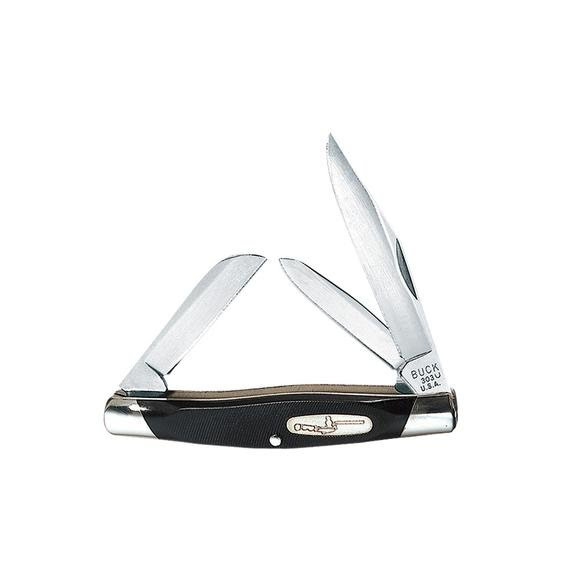 Slightly smaller than the Stockman the Buck Cadet also has the same three convenient blades: Clip, Sheepsfoot and Spey. The sheepsÂ­foot blade is handy for cutting and slicing. The cutting edge is straight, leading to a point which curves back to an unsharpened top. With the curved end of the blade being closer to perpendicular to the blade&apos;s axis than other knives and lacking a point, making penetration unlikely, spey blades are common for skinning fur-bearing animals.